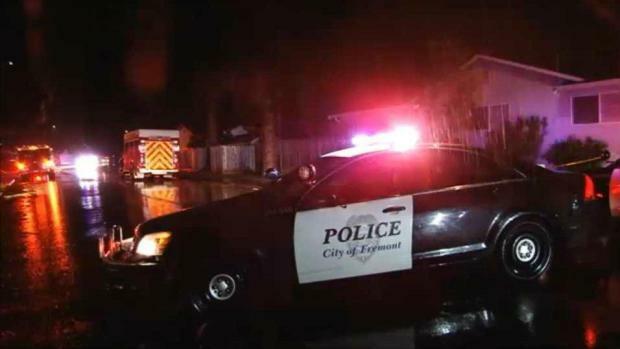 One person is dead and another is hospitalized after they were shot while driving in Fremont late Tuesday night, causing their vehicle to crash into the side of a house, police said. The shooting was reported at 11:18 p.m. in the 34000 block of Torrington Court. Officers arrived and found a male victim with multiple gunshot wounds in the passenger seat of the vehicle, which had crashed into the home at the corner of Chaucer Drive and Torrington Court, according to police. He was pronounced dead at the scene at 11:35 p.m. and his name is not yet being released, police said. Two people were shot, including one fatally, in Fremont during the overnight hours Wednesday, according to police. Pete Suratos reports. Witnesses reported a second male running away from the scene and he was located nearby at about 11:50 p.m. He also had gunshot wounds, but they were not life-threatening, police said. Investigators determined the second victim was the driver of the vehicle and an associate of the victim who died. He was taken by ambulance to a hospital to be treated for his injuries. No arrest has been made in the case, Fremont's third homicide in 2018. Anyone with information about the shooting is asked to call Fremont police at (510) 690-6900 or to email Detective Nordseth at snordseth@fremont.gov. Tips can also be sent by text message to 888777 with a message starting with "Tip FremontPD."